Who needs a yogurt maker? 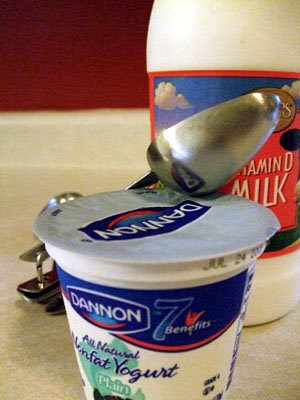 Start here, with a quart of milk and two tablespoons of plain yogurt. There’s more science than cooking to making yogurt. Don’t panic. We’re not talking Avogadro’s number stuff here; we’re talking vinegar and baking soda volcanoes. Making yogurt is an easy exercise. The hardest part about making yogurt is keeping the milk from boiling over. Cleaning burned milk off a burner is tough stuff, and it smells pretty foul. Try to not let it happen to you. Don’t let the milk boil over. Homemade yogurt is notable for what it lacks: sugar. I find a lot of flavored yogurt too sweet, and many low-calorie yogurts are made with sweeteners such as sucralose and aspartame, which I find cloying and fake tasting. 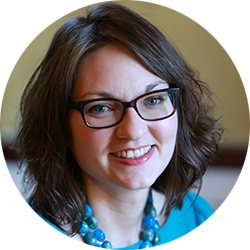 Extra chemicals aren’t missed when you’re eating DIY yogurt sweetened with honey or maple syrup. There is a bit of babysitting involved, but after about 45 minutes, it’s a hands-off project. This makes about a quart of yogurt. – Heat quart of milk to boiling. This took me about 10 minutes on medium-medium high heat. 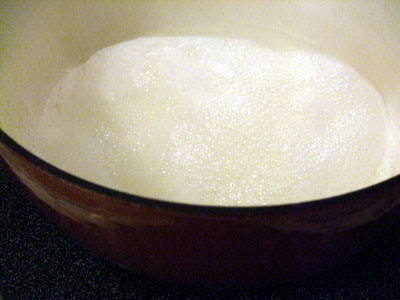 Watch your pot closely; milk boils over very easily and quickly. – Boil milk for one minute. – Remove milk from heat. Let milk cool to 115 degrees Fahrenheit. This took about 30 minutes. – Stir plain yogurt into cooled milk. – Put the milk in a bowl, and cover the bowl tightly. I use a plastic bowl from IKEA with a tight-fitting lid. – Place the bowl in a warm place (slightly warmer than room temperature). I put the bowl in my oven with the light on. 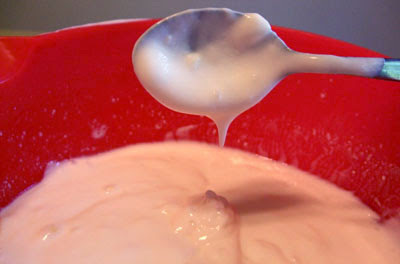 – Your yogurt will have thickened (shift around the bowl to check consistency). If you don’t think it’s thick enough, don’t fret: Put the yogurt in the fridge; it will thicken more. 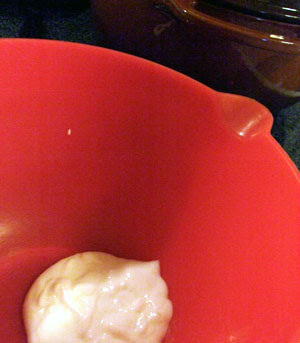 The plain yogurt starter sits in the tight-sealing IKEA bowl. The Fannie Farmer recipe says that using too much yogurt starter or letting the yogurt set for too long will make it watery. It also says the longer you incubate it, the more sour it will be. I have found this last tip to be true, but I’ve never had a batch go so sour that I wouldn’t eat it. Try eating this yogurt with fresh fruit, nuts, honey, and a bit of cinnamon and ground ginger. It’s also tasty with granola. I also substitute plain yogurt for sour cream. The texture is a bit different, but the taste is comparable. 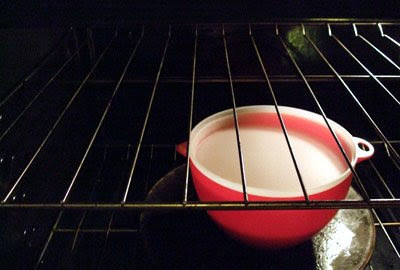 The yogurt incubates in the oven with the light on. If you like making yogurt, try making yogurt spread. And if you like that, take it to the next level by making yogurt cheese. These recipes are adapted from the June 2009 edition of Everyday Food. – Place yogurt in a cheesecloth-lined strainer over a bowl in the fridge. – Allow the yogurt to drain for about 24 hours. The liquid that drains off is the whey. – Flavor the thickened yogurt with herbs, olive oil, salt, pepper. I’ve never tried it, but I suppose you could make a sweet spread with raisins or another dried fruit and some honey or maple. Serve as a spread for crackers or bread. – Allow the yogurt to drain for two days. It will be more solid than the yogurt spread. – Use a spoon or small cookie scoop to make cheese balls. – Put them in a sealable container, cover the balls with olive oil, and throw some herbs into the mix (I like sprigs of thyme). – The result is creamy, herb-infused cheese that’s delicious on crostini or focaccia. If you like goat cheese, you’ll like yogurt cheese. The finished yogurt: tangy and thick. A 32-ounce tub of Dannon yogurt costs $3.09 at my local grocery store. A quart (32 ounces) of whole milk costs $1.45. If I fire up my calculator, you save 53 percent making your own yogurt. Delicious, healthy, and economical.